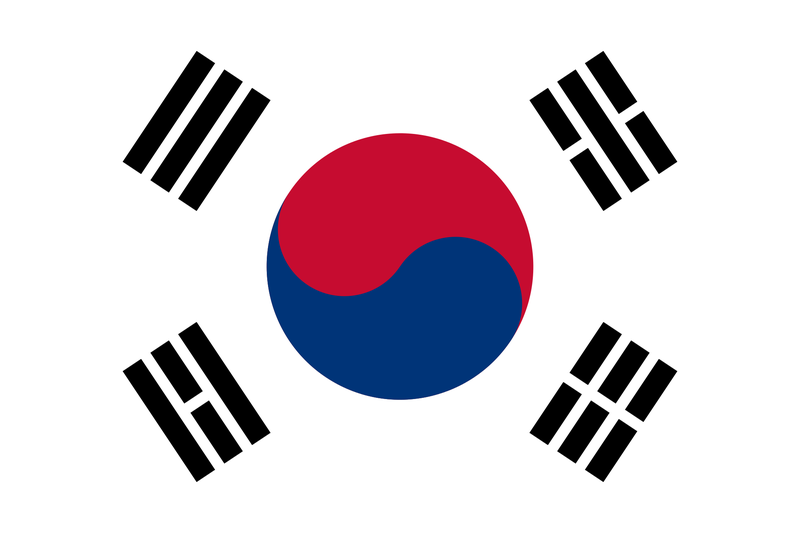 The flag of South Korea, also known as the Taegukgi, was adopted on July 12, 1948. It was updated on October 1997. The Republic of Korea, more commonly known as South Korea, is located in Southeast Asia in an area known as the Korean peninsula. South Korea maintains a strong technologically sophisticated culture. More than 82.7% of the country has access to the Internet, with an average of 24.6Mpbs nationwide (the United States maintains an average internet connection speed of 11.4Mbps). Many innovative products such as curved TVs and the virtual supermarket thrive here . South Korea also maintains a popular culture that transcends into other nations. Plastic surgery, cosmetics, music, and other aspects of celebrity culture are world-renowned . For a country with such a high focus on self-expression and the arts, South Korea’s rank on the World Press Freedom Index has been steadily declining the last few years. In 2011, the country was ranked at 42nd . From 2011-2012, the rank shifted downward to 44th. In 2013, the rank declined again to 50th . Despite the government structure in the form of a democracy, South Koreans and journalists have restricted speech when it comes to criticizing government officials. “There is growing evidence that freedom of expression in South Korea has lagged behind … and that it has deteriorated since 2008.”. Koreans are decedents from the Choson dynasty, who ruled the Korean peninsula for more than 500 years, from the 1400s to 1910 . During the end of their reign, the Chosons became dependent with their neighbor China due to Korea’s isolation. The country had also failed to exclude itself from Western imperialism, resulting in opening their trade market. Korean began to create a huge debt to Japan, and feared this debt “threatened the nation’s independence and sovereignty.” . Japan would come to occupy Korea after the Russo-Japanese war until surrendering to the Soviet Union and the United States after World War II. The growing hostilities between the two greatest superpowers would impede on the plan of unifying Korea under a single nation. Two separate governments were instead established: North and South Korea. However, the Soviet Union appointed Kim II-Sung as the ruler of both Koreas in 1948. Sung, who believed that Korea should be unified underneath a communistic government, invaded South Korea in 1950. This sparked the Korean War, and an important chapter in the Cold War between democracy and communism. With the United States funding South Korea and the Soviet Union funding North Korea, the war ended in a 1953 armistice that officially split the two countries and established a demilitarized zone separating the two. No peace treaty has ever been signed, and the two countries are still technically at war . South Korea would eventually establish a democratic system similar to the United States in 1987. This government entity, known as the Sixth Republic, is still in power today. The population of South Korea in 2007 was estimated at 49,044,790 . 80% of the population is classified as living in urban areas. Despite influence from the United States, South Korea’s journey to a democratic government was a painstakingly slow process. During the 1970s, South Korea was under the rule of President Park Chung-hee. Many South Korean citizens did not have much of a say in the government policies, and criticism of the government would often result in criminal charges. “After President Park’s policies, planning and leadership… South Korea’s economy grew beyond most people’s wildest imagination … Yet … the government suppressed civil rights and liberties and often dealt severely with dissenters .” In order to make this legal, Park passed emergency measures to ensure complete control over the population. One of the measures, Emergency Measure 9, stated any criticism, especially through the means of press coverage, would be subjected to a minimum of a one-year prison sentence. As a result of this measure, many citizens would be arrested for being a communist. The economic prosperity, in which Park was responsible for producing, would eventually wane and heighten the opposition of Park’s policies. In August 1979, almost 200 female employees of the Y.H. Company staged a sit-in at the New Democratic Party headquarters to enlist public sympathy due to the company’s recent bankruptcy. Park sent riot police to drag the workers out, killing a female employee in the process. This incident would inspire more citizens to oppose Park’s oppressive government and ultimately contribute to its downfall . President Park was assassinated months later by the head of the Korean Central Intelligence Agency. It was becoming clear that South Koreans wanted to take a shot at democracy despite their history of authoritative regimes (Choson dynasty and Japanese occupation). Their efforts would pay off relatively soon. Despite the transition to a democratic government, the country still held sanctions against specific speech. In 2004, a South Korean court fined a student 1.5 million won for posting cartoons of national political figures . This cartoons mocked the political figures, which violated the electoral law. This was the first time that the country had ever punished someone for an Internet posting. Sooner after, another student was arrested and charged for breaking electoral law by sharing cartoons of political officials. The law that these students had broken was a decree that stated that sanctions against news media should also apply to the Internet. This decree is initially enabled to prevent the media from hiding facts or distributing false information about a political party or candidate and bans public opinion polls. Limiting the press’s free speech was a fundamental standard in authoritative governments. In South Korea, this was no different. When Chun Doo-Hwan gained control of the civilian government in 1980, a bill was passed known as the Basic Press Act of 1980. This act required journalists to coordinate with government officials. It set reporting guidelines to newspaper editors that restricted editorials, stories, and periodicals. If news media did not abide by these standards, they were subjected to prosecution. This bill received strong criticism, especially from Roh Tae-Woo, the presidential candidate for the Democratic Justice Party. Roh would eventually have the act repealed in November 1987 and replaced with the Act on Registration of Periodicals and the Broadcast Act. This forced the government to issue a court order before revoking the registration of a periodical . This caused the number of periodicals to rise due to the removed restrictions. In October 1988, a military court convicted some of its own officers for assaulting a newspaper editor because he had published a negative story about the South Korean military. The result of the case, which ruled in favor of the editor, was a major breakthrough to the political balance from a military-dominated culture to one which a stronger emphasis on democratic means. “The case involved publication of a newspaper article titled ‘Military Culture Should Be Eradicated,’ which argued that a military culture still pervaded South Korea despite President Roh’s promises for democratic reforms.” With the decision, the military courts had hoped to improve public opinion of the military during this time. They realized that this assault did not help their public image. This was a prime example that the power had shifted to the voice of the people instead of the military. While South Korea’s rank has decreased over the past few years on the World Press Freedom Index, the United States’ rank has greatly increased and surpassed South Korea. From 2011-2012, South Korea was 3 places ahead of the United States. In 2013, the United States would climb up to reach rank 32, and South Korea would be moved to 50th. South Korea’s government has a rough history of taking criticism. Because past authoritative governments could punish citizens who disagreed with them, the government finds it harder to silence opinions that disagree with the government’s direction. In 2014, a Japanese journalist was charged with defamation against President Park Geun-Hye. The story in question was titled “President Park Geun-Hye went missing on the day of the ferry sinking… Who did she meet?” . It’s hard to imagine a prosecution such as this standing in the United States. The guarantees of freedom of the press in United States Bill of Rights would protect this publication were it published in America. Other cases in South Korea, such as the circulating caricatures of political figures and the journalists challenging Park Ji-man’s involvement with the murder of his cousin, would also be free to be published in the United States for the same reasons. These articles are far from extreme, compared to other articles that have been published in the United States that have been allowed to be published, such as the Pentagon Papers by the New York Times or documents obtained by Edward Snowden. This is possible due to the First Amendment to the United States Constitution stating “Congress shall make no law respecting an establishment of religion, or prohibiting the free exercise thereof; or abridging the freedom of speech, or of the press; or the right of the people peaceably to assemble, and to petition the government for a redress of grievances.” . Despite to the harsh treatment against criticism, South Korea is still regarded as a forefront of democracy. They are a relatively new nation with many similarities with the United States. The United States serves as a great mentor due to the history between the two nations, and their alliance against communism. As such, their Constitution will continue to be revised as they head deeper into the 21st century. Citizens, who have fought hard to get South Korea to where it is today, are realizing that to maintain a just democracy and government, it is a constant battle to keep authorities in balance. Kim, J. (2012). A history of Korea [electronic resource]: from ‘land of the morning calm’ to states in conflict / Jinwung Kim. Bloomington, Ind: Indiana University Press, 2012. p. 322. Korea, South. (2014). Funk & Wagnalls New World Encyclopedia, p. 1. Heo, U., & Roehrig, T. (2010). South Korea since 1980 [electronic resource] / Uk Heo, Terence Roehrig. Cambridge; New York: Cambridge University Press, 2010. p. 2. Kim, op. cit., p. 472. Kim, op. cit., p. 482. Youm, K. H., & Salwen, M. B. (1990). A Free Press in South Korea: Temporary Phenomenon or Permanent Fixture?. Asian Survey, (3). 315. “First Amendment”. Cornell University Law School Legal Information Institute. Archived from the original on May 3, 2013. Retrieved May 3, 2013.